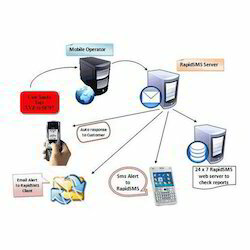 Our service range includes a wide range of short code sms service. We are engaged in offering world class Short Code SMS Service that are highly appreciated for high quality standards, cost-effectiveness and timely execution. We can also push the incoming message on your database in real time. For that you will be required to create a script which will process the incoming message. On every message we received for you, we will call that script in real time. All our trained personnel are hired by us after evaluating their qualification, skills and past experiences. Process the message and send custom reply from a database (real-time).